Hi and once again, thank you for stopping by.We are just so excited to be showing you special and gorgeous projects that you can make with the new products from Stampin’ Up!’s Autumn Winter, Mini Catalogue and all items are available now. This is one of the most exciting minis I have seen for a while and I almost wanted everything in it!!!! Your Blog Hop may have started with me or you may have come from the wonderfully talented Sharlene Meyer. It really doesnt matter. If you havent done so already, grab yourself a well deserved cuppa, a notepad and pen, and “hop” around. You are going to love it all like we do!!!! First things first before I show you my “Baby Prints” Collection (yes I am calling it that), just a little housekeeping from ESAD. I have had so much fun with the stamp set. I literally fell in love!! 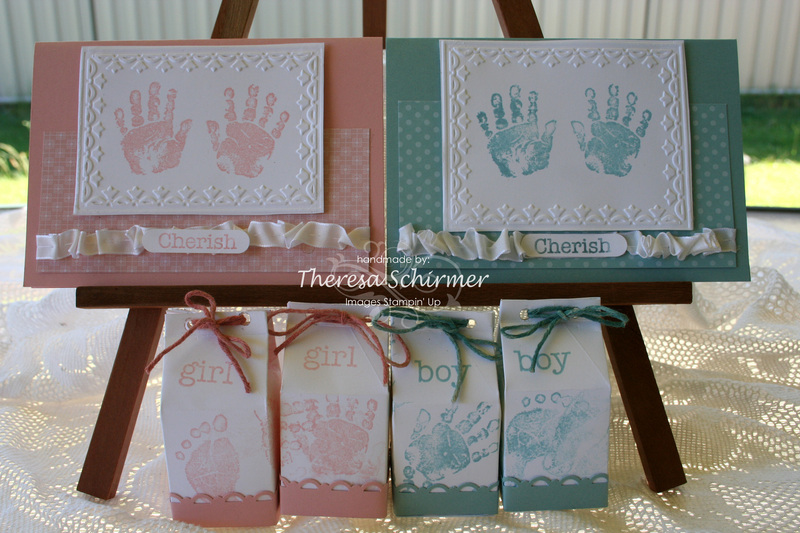 This stamp set is also so very perfect for all your baby scrap book pages. I have chosen Baja Breeze and Blushing Bride as they coordinate with Stampin’ Up!’s new Satin Pleated Ribbon. There is also Cherry Cobber and Pear Pizzazz in the range. I am sure you will agree with me on how extraordinarily luxurious this ribbon is. I really love this card and I have made the same card in the Blushing Bride, however, you can see it in the broader collection and I want to save some room for the other items in my ‘collection’. 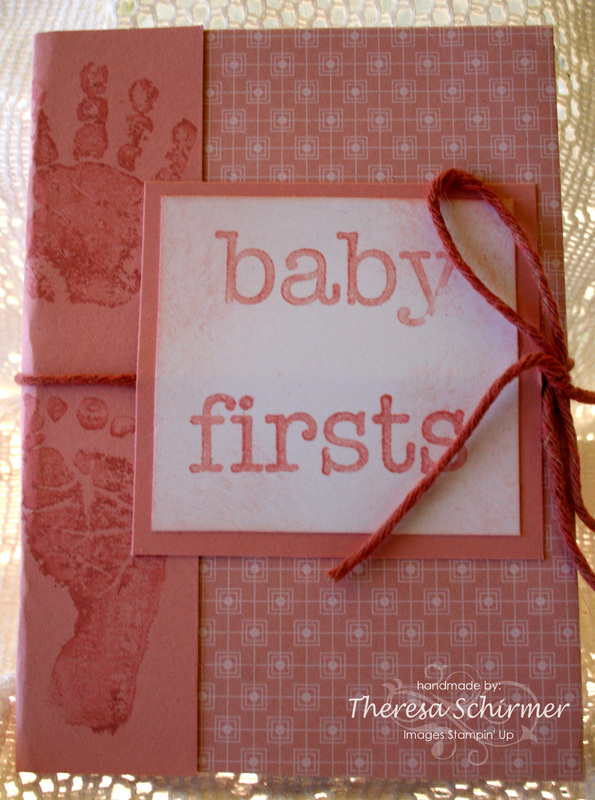 Baby Prints "Firsts" Mini Notebook - Blushing Bride. Hand dyed coordinating cotton twine. I have 4 children of my own, 3 girls and 1 boy, they are well past the age that I would need one of these. This is a mini composition book that I have altered. Its small enough to fit in the corner of a nappy bag or hand bag so that if you are out with bub and a ‘first’ occurs, it can be jotted straight down! I always thought, I will write that down when I get home and didnt as it was always busy on arrival at home from a day out with bub or bubs in tow. 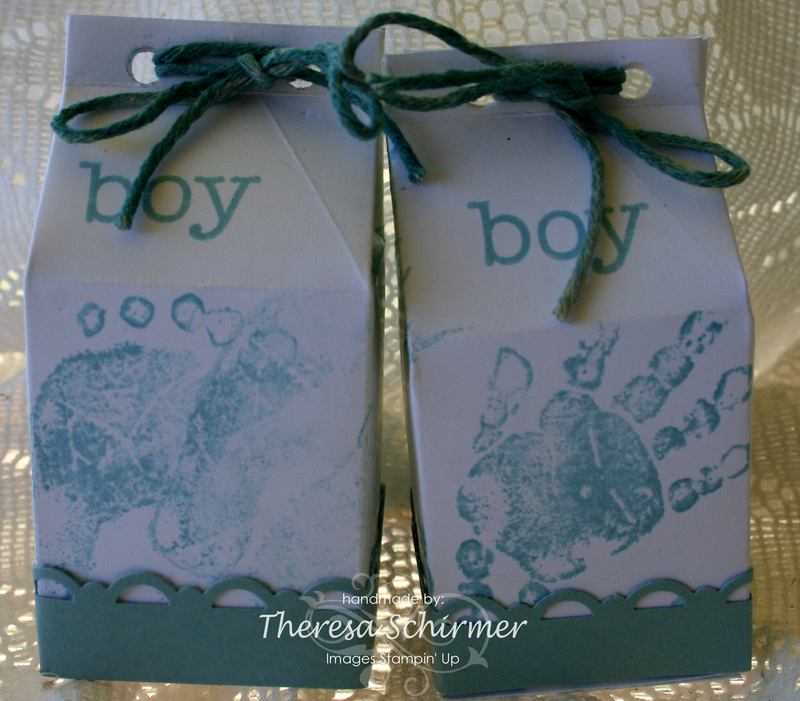 Baby Prints - Baja Breeze - Mini Milk Cartons. These are just so gorgeous! A cute and novel way to say thank you to guests for attending those special days before and after bubs arrives. On both the “Firsts” Notepads and these Mini Milk Cartons, I hand dyed the cotton twine to match the projects. I am very pleased with these first attempts at this. Finishing off with this last picture. It again features the Mini Milk Cartons and a lovely card using gathered Whisper White Ribbon and the lovely Framed Tulips Embossing Folder. I took too many photos to upload them all to my post today and I hope that I have given you some inspiration of what can be done with this most lovely of stamp sets. Time to hop on and see what lovely projects Carolyn Cassidy has made with absolutely gorgeous “Tea Shoppe”. Please feel free to leave comments on my fellow blog players as well as mine. We love to hear what you have to say. If you get lost, simply come back here and try another link to keep going. Thank you so much for your patience and for stopping by, until next time….